Here we go again. Despite all the pre-IPCPR madness I am committed to doing at least one blind review a week. Possibly more. If you are nice. Anyways. As I mentioned last week I am actually tearing through yet another set of blind cigar reviews that Brooks over at Smoking Stogie was kind enough to send my way. Anyone who knows Brooks, or is familiar with Smoking Stogie, you know just how rare, or exclusive these cigar just may be! This is the 7th cigar in the set, and before I start babbling anymore I’ll get right to it. Prelight: Woah, now this is a dark cigar. In the picture above it’s even hard to make out where the cigar ends and my black dining room table begins. 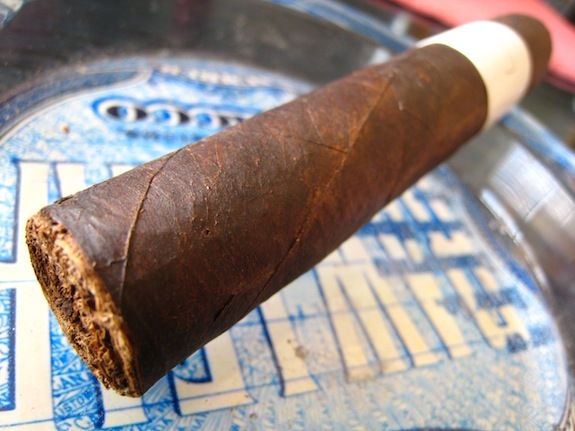 The wrapper of this cigar is one of the darkest I have ever seen, black and a very dark brown with an almost perfectly consistent color minus the extra darkness around the foot. The wrapper is very old and rustic looking, tooth, and full of thick veins. Hopefully they won’t be any burden as I smoke through this cigar. The wrapper shines like duct tape, reflecting tons of sunlight off the beaten body before leading up do the seamless round double cap. 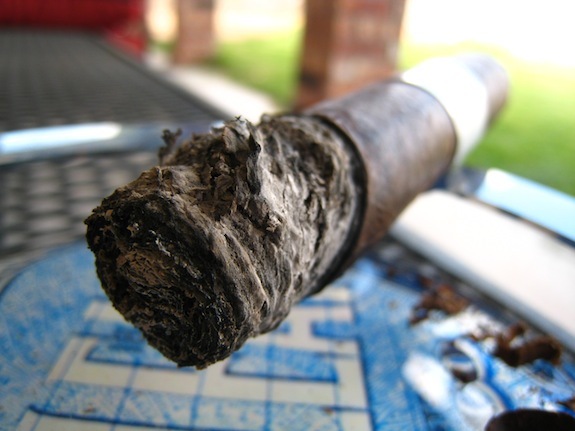 I may be wrong but this cigar really looks like it has had some better days. Well aged maybe? At this point only Brooks knows. Outside of the cigars visual characteristics Cigar #7’s wrapper pumps out a very rich cedar and an almost sandalwood type aroma. It smells a lot like incense. 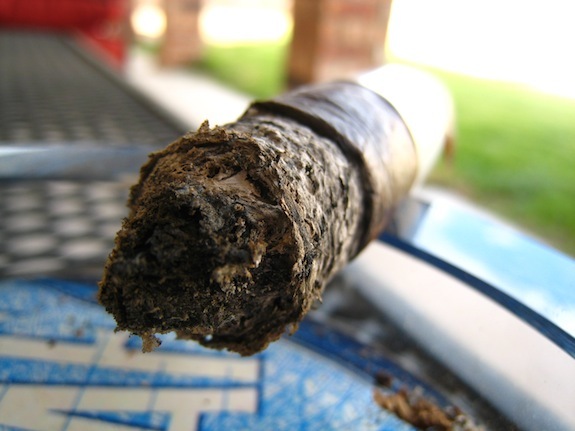 The foot of the cigar only gives off a very slight leather and muddy type smell. 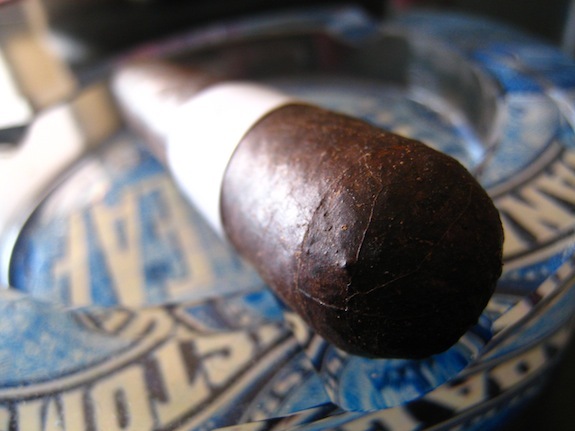 The cigar cut easy and clean using my double bladed Palio cutter, although the wrapper seemed really thick. The cold draw on this cigar is rather interesting. It tastes much like I am eating a gingerbread cookie. Sweet sugar, cinnamon, and a bit of coffee. The draw is a bit tight though but hopefully that opens up as I smoke the cigar. First Smoke: This cigar was crazy easy to light using only my single flame butane torch. The first surprise was the pepper. I really didn’t pull any signs of pepper form the scent of the cigar, nor from the cold draw, but this cigar threw out a little fit of pepper shortly after lighting up. After the pepper, the cigar gets rolling with nice cedar and strong espresso flavors. There is a bit of that brown sugar I mentioned in there but at this point the strong coffee flavors are dominating the experience. The draw is a little tight, but a whole lot easier than I was expecting. It only takes a view puffs to get a good thick draw from this cigar. The stationary smoke is crazy, giving off massive trails of smoke the entire time this cigar sits in my ashtray. 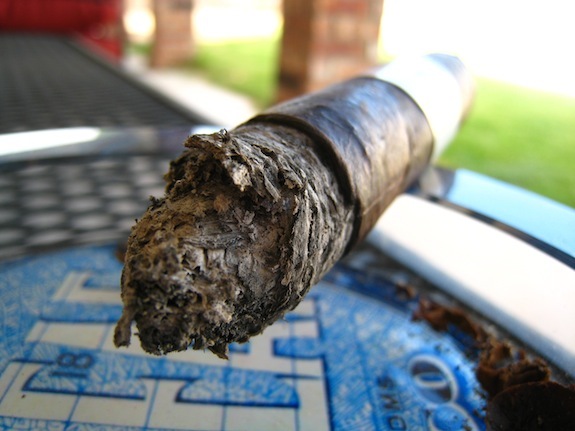 The burnline on this cigar is crazy and really has a mind of its own burning way deep on one side of the cigar while the other side struggles to keep up. 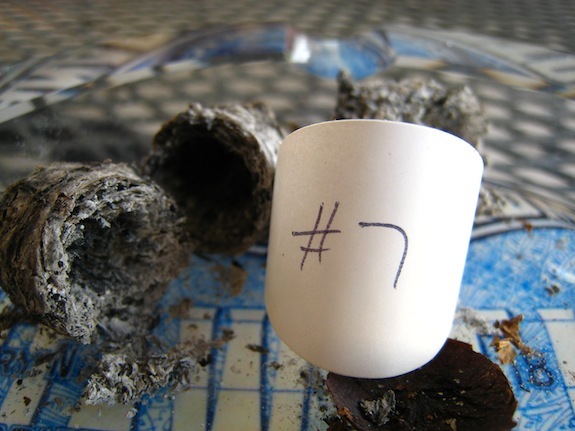 The ash is interesting too. It starts off very dark grey but then turns into this flaky mess of white and light grey ash with dark spots around the edges. The ash held on for about an inch before giving way. Halfway There: I don’t know how it did it, but this cigar has almost completely self-corrected the train-wreck of a burnline into the second third. The main flavor is still the bold espresso, now with a ton of dark chocolate, and only a slight bit of cedar mixed in. The retrohale on this cigar quickly reveals there is still a ton of pepper and spice waiting to take part in this cigar’s experience. Outside of that, the more I smoke this cigar, the more the body builds. Another side note is this is a very dry cigar. What I mean by that is no matter how much water I drink I am still left with this sore dryness left in the back of my throat. Maybe it’s just the dry desert heat, or maybe it is in fact the cigar. Whatever the case may be I felt it was worth mentioning. Finish: As quickly as the chocolate came, it faded. I am not left with a rich espresso flavor with the cedar, spice, and even the pepper creeping back into the picture. This cigar does have it’s share of change-ups. Maybe it’s just me, but the body of this cigar is ridiculous. It just keeps building and building in attempt to completely blow me off my feet by the end of the cigar. It really packs a punch. Sadly, with only an inch remaining in this cigar some blatant harshness began to find it’s way into the experience. All in all, this cigar took a little over an hour to take down. 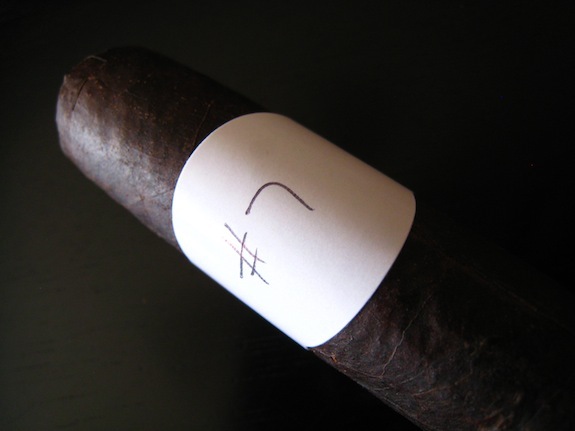 Overview: Although this being a very interesting experience, cigar #7 didn’t go without flaw. The harshness, burn, flaky ash, and flavors didn’t wow me as much as I wish they would. My main complaint about the flavors were the pepper and espresso really dampened the nice cedar flavor that was dying to show through. I think if the cedar had more room to grow it would have resulted in a much more tasty, and smoother smoke. I did like the cigar’s ability to rapidly change up, and the full body that just continued to build and build. This isn’t a cigar I would go chasing after, but I wouldn’t mind having a few lying around for those days that I want to reach for something stronger. So what did I think it was? I’d really have to coin this cigar as a La Flor Dominicana. The flavors matched, as well as the pepper, spice and body. But I am not completely sold on this being a Nicaraguan Puro cigar. The wrapper kicked out tons of flavors but the backing flavors weren’t as bold and straight forward as I come to expect from Nicaraguan tobacco. My second guess would have to be a CAO Maduro. I have had a few very well aged CAO Maduro’s lately, and despite them normally being flat experiences, age does them very well. And the reveal! This cigar was a Padilla La Terraza Maduro! Yeah I wasn’t expecting that. Padilla’s La Terraza line is the newest value line released earlier this year. 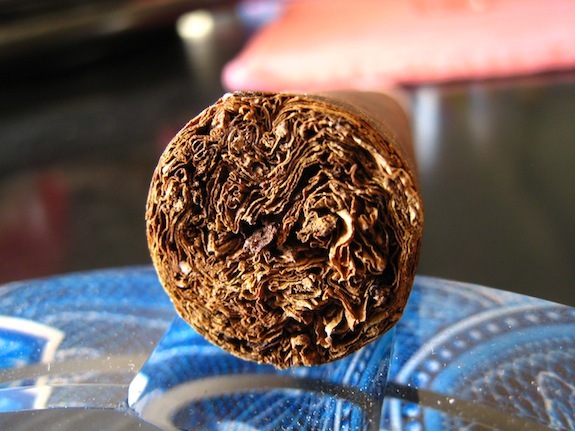 The cigar is a Nicaraguan puro and each of these cigars run about $4.50 for a single, or roughly $80 for a box of twenty. With that in mind, does it change my thoughts on the cigar any? Not entirely. But what it does do is it take this cigar into a totally different spectrum. I was honestly expecting at least an $8 stick. That alone tells you that this is a hell of a cigar for the money! Now that I know the price I really do think this is a cigar I’d like to keep around. It’s the perfect “high volume” everyday cigar. It fits right up there with CAO Traviata, or even the Henry Clay that Brooks threw my way during our last set of blind reviews. Boxworthy? Totally. Wow, that reveal was an eye opener! I’ve been wanting to try these, but I didn’t expect it to be that strong. Hopefully, some age will help round things out. Great blind review. It goes to show that there are all kinds of surprises out there.